The Mitsubishi X-2 Shinshin (formerly the ATD-X) is a Japanese experimental aircraft for testing advanced stealth fighter aircraft technologies. It is being developed by the Japanese Ministry of Defense Technical Research and Development Institute (TRDI) for research purposes. The main contractor of the project is Mitsubishi Heavy Industries. Many consider this aircraft to be Japan's first domestically made stealth fighter. ATD-X is an acronym for "Advanced Technology Demonstrator – X". The aircraft is widely known in Japan as Shinshin (心神, meaning "one’s mind" or "Mount Fuji") although the name itself is an early code name within the Japan Self-Defense Forces and is not officially in use. The aircraft's first flight was on 22 April 2016. At the beginning of the twenty-first century, Japan, seeking to replace its aging fleet of fighter aircraft, began making overtures to the United States on the topic of purchasing several Lockheed Martin F-22 Raptor fighters. However the U.S. Congress had banned the exporting of the aircraft in order to safeguard secrets of the aircraft's technology such as its extensive use of stealth; this rejection necessitated Japan to develop its own modern fighter, to be equipped with stealth features and other advanced systems. A radio-controlled 1/5 scale model made its first flight in 2006 to gain data on performance at high angles of attack and to test new sensory equipment and self-repairing flight control systems. Following these preliminary steps, the decision was taken in 2007 to push ahead with the multi billion-yen project. At the time of this decision, production was forecast to start roughly 10 years later, around 2017. In 2007, the ATD-X was expected to conduct its maiden flight in 2014. In 2011, the maiden flight was projected to take place in 2014 or 2015. The 40 billion yen construction project in the Mitsubishi's Komaki South Plant began in 2009 and is under supervision of the Acquisition, Technology & Logistics Agency of the Defense Ministry. In July 2014, the TRDI (Technical Research & Development Institute) released the first official photos of the ATD-X prototype, and stated that the aircraft was undergoing ground testing. The fighter prototype was expected to be fully developed by 2018. The ATD-X program will then lead to the Mitsubishi F-3, which should carry sixth-generation technology, and is expected to be produced in 2027. The ATD-X prototype was officially unveiled on 29 January 2016. The aircraft's first flight was expected the following month; it carried the X-2 official military designation at the unveiling. The X-2 made its maiden flight on 22 April 2016 taking off from Nagoya Airfield and landing at the JASDF's Gifu Air Field after a 26-minute flight. The unusually prolonged period between structural completion and first flight has not been fully explained. The Jiji News Agency reported that the X-2 has a take-off weight of 13,000 kg (28,700 lb); Japanese media reported its weight as nine tonnes (9,000 kg; 20,000 lb), heavy for a demonstrator of these dimensions 9.1 metres (30 ft) span and 14.2 metres (47 ft) long. By July 2018, Japan had gleaned sufficient information from flight tests for a determination, and decided that it would need to bring on-board international partners to complete this project. Several companies have responded. Lockheed Martin is reportedly offering an updated version of the F-22 Raptor. British based BAE Systems also entered talks about which little is yet reported. Third to enter the competition is Northrop Grumman and there is speculation that it will offer a modernized version of the YF-23 to Japan. The ATD-X will be used as a technology demonstrator and research prototype to determine whether domestic advanced technologies for a fifth generation fighter aircraft are viable. The aircraft features 3-D thrust vectoring capability. Thrust is controlled in the ATD-X by three paddles on each engine nozzle similar to the system used on the Rockwell X-31, while an axis-symmetric thrust vectoring engine is also being developed for the full-scale production model. Among the planned features of the ATD-X is a fly-by-optics flight control system, which by replacing traditional wires with optical fibers, allows data to be transferred faster and with immunity to electromagnetic disturbance. Its radar will be an active electronically scanned array (AESA) radar called the 'Multifunction RF Sensor', which is intended to have broad spectrum agility, capabilities for electronic countermeasures (ECM), electronic support measures (ESM), communications functions, and possibly even microwave weapon functions. A further feature will be a so-called 'Self Repairing Flight Control Capability' (自己修復飛行制御機能), which will allow the aircraft to automatically detect failures or damage in its flight control surfaces, and using the remaining control surfaces, calibrate accordingly to retain controlled flight. The JASDF is reported to have issued a request for information for engines in the 40-to-90 kN (10,000-to-20,000 lbf)[clarification needed] thrust range to power the prototypes while Ishikawajima-Harima Heavy Industries is to provide the engines for the completed fighter. ^ "日本心神 横山大観" (in Japanese). Cultural Heritage Online, National Institute of Informatics (NII). Retrieved 22 November 2017. ^ "Mitsubishi ATD-X ShinShin a Japanese Stealth Fighter". Defence Aviation. 11 January 2008. Retrieved 29 January 2008. ^ a b c Miyakawa; et al. "Research of Flight Control System for High Maneuver Aircraft" (PDF). 三菱重工技報. Retrieved 17 June 2009. ^ "Japan to build stealth fighter jets by 2014". Air Force Times. 7 December 2007. Retrieved 29 December 2008. ^ "Photos of ATD-X Japan's Stealth Jet". defensetech.org. ^ "Japan unveils 1st domestic-made stealth plane". Japan Today. 29 January 2016. Retrieved 29 January 2016. ^ "三菱重工、国産ステルス戦闘機「X-2」の飛行試験機を初公開" (in Japanese). marketnewsline. 28 January 2016. Retrieved 29 January 2016. ^ Technical Research and Development Institute (12 July 2014). "先進技術実証機の現況". mod.go.jp. Archived from the original on 16 July 2014. Retrieved 12 July 2014. ^ Bradley Perrett (22 October 2012). "Japan Aims To Launch F-3 Development In 2016-17". AW&ST. The McGraw-Hill Companies. Retrieved 30 October 2012. ^ Waldron, Greg (29 January 2016). "ATD-X to spur Japan's advanced fighter research". Flightglobal. Retrieved 29 January 2016. ^ Japan Unveils New 5th Generation Stealth Fighter Jet. Accessed 30 January 2016. 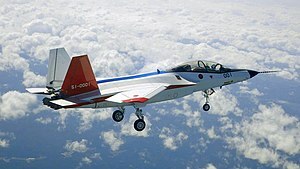 ^ "Japan unveils the X-2, country's first stealth fighter jet". Asia Times. 28 January 2016. Retrieved 30 January 2016. ^ "Japan becomes fourth nation to test-fly homegrown stealth jet". The Japan Times. 22 April 2016. ^ "MHI X-2 Fighter-Technology Demonstrator Makes First Flight". Aviation Week. 28 April 2016. ^ Mizokami, Kyle "Now Northrup Grumman Wants to Build Japan's New Fighter Jet" Popular Mechanics, 10 July 2018. Retrieved 15 August 2018. ^ a b c d "Japanese Military Technology Advances". International Assessment and Strategy Center. Archived from the original on 17 April 2012. Retrieved 17 June 2009. ^ Jennings, Gareth (27 January 2016). "Japan prepares for ATD-X maiden flight". Jane's Defence Weekly. Surrey, UK: Jane's Information Group. 53 (12). ISSN 0265-3818. Wikimedia Commons has media related to Mitsubishi X-2. This page was last edited on 5 April 2019, at 02:04 (UTC).